MuirMcNeil Two Point is a monospaced geometric type system which explores the use of progressive permutations to generate typographic forms. Inspired by early dot matrix and LED display lettering, it facilitates the production of an extensive range of visual outputs. In TwoPoint, like other MuirMcNeil typefaces, the parts of individual letters operate as variable components within differential systems. A common grid determines positioning in all TwoPoint typefaces for both contours and spaces, with every dot and space aligning consistently. TwoPoint typefaces are designed to interact with one another, offering a wide range of visual possibilities. Using page layout, bitmap or vector design software, the user can apply selected styles either in precisely interlocking layers or in easily calibrated offset overlays. Outlines, tints, colours, textures, patterns and transparencies can be applied as appropriate. These features provide an enormous number of possibilities when working in print and fixed media. They are also particularly useful in motion graphics where their precise layering and positional calibration allows perfect control over transitions and many other exciting visual opportunities. Each TwoPoint style is available in six weights from Light to Black. Weight is incremented without changing any positioning. Instead, the diameters of individual dots within each letter change progressively rather than thinning or thickening the stroke width. The six weights in each group are identified both by name and numerically. The number codes describe dot diameters in units as fractions of the 1000 unit Postscript em square. In ‘TwoPoint B 044 Regular’, for example, the numerical value indicates the dot component diameter (44/1000 units). As a result, size and weight ratios can be accurately calculated in setting typographic compositions. An additional typeface providing grid backgrounds in corresponding weights and screen patterns is supplied for further design opportunities. 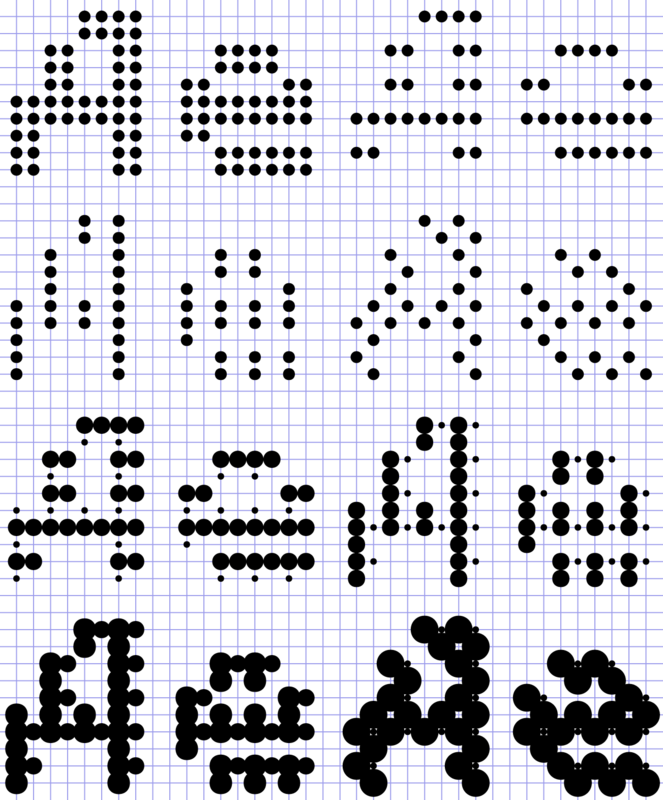 TwoPoint is available in Latin glyph encoding in OpenType format.